beautiful sister for brother Lance Dowd. 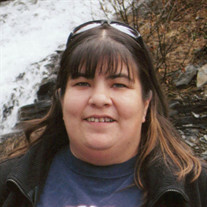 Paula was raised in Fort Nelson and did her schooling there. wouldn't get hurt. Mom told her, "Now lets quit hockey and go into figure skating". Paula spun around with hands on her hips and said, "I am not twirling around in the middle of the ice for nobody!" She loved hockey. first warning. Winter time you would find Mom, Lance, and Paula sliding on the hill. the TV screen or on Facebook. employed as a waitress at Trapline and housekeeper for the Blue Bell Hotel. She was fired when she told them she couldn't come to work because her dog was sick. She moved to Fort St. John and flagged for a few years with her Mom. After this boring job, she got her tickets and went for her favorite job - piloting and hotshotting for Ditmarsia Holdings. She loved working there. Paula worked side by side with her mother for years, selling Native crafts. She was highly skilled in using technology and was her mom's manager. The family went to her for help with anything involving computers, Facebook, etransfers, etc. Mom misses you so much, my baby. (Alice) Needlay; as well as numerous cousins. Simoneau; and cousins Jacqueline Needlay and Corina McCarthy. Expressions of sympathy may be made to the SPCA.